When I was growing up, Saturday night was pizza night. My mom would begin making the tomato sauce early in the morning and let it simmer all day. She would start the dough in the afternoon, letting it rise at a nice easy pace, then punch it down and let it rise again. In the early evening she would roll out the dough very, very thin, put it in a round pizza pan, top it with the sauce, some mozzarella cheese and sometimes some ground beef or sausage. The oregano would go on last. My mom would bake her pizza it until it was very crispy. It was so delicious, it honestly was to die for. Everyone who tasted it was hooked. Later on when I became older and met my husband, he too fell totally in love with my mom's pizza. He began making it for us when we got married, using her her original recipe. He was fascinated with the dough process and how also thin he could roll it and how crispy he could make it. Our sauce, unfortunately, was never quite the same as my mother's. It's probably because I did not can fresh tomatoes like she did, so I never could replicate that deep rich taste. Eventually we did create a substitute. A few years ago when our household became gluten free, the pizza was one of the first things that had to go. 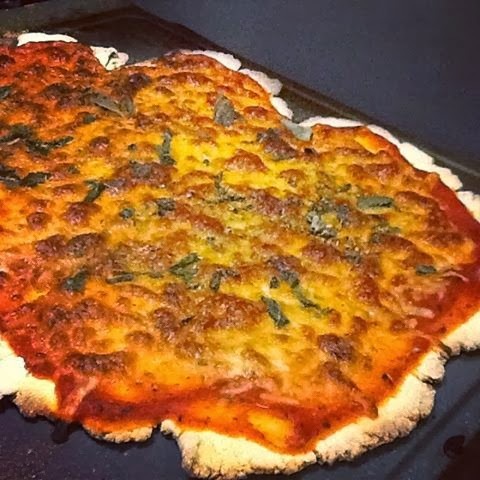 We missed it, the kids missed it, and even though we dutifully tried just about every gluten free crust and dough recipe, the pizzas were just never the same. The crusts were just too thick, and over all tasted pretty icky. One day my husband came across my mom's dough recipe and decided he would try to make it exactly as written, only substituting gluten free flour. No other additions or adjustments. We had a feeling it might actually work because we were going to use the Cup 4 Cup Gluten Free Flour, which I think is the closest replication on the market to regular white or unbleached wheat flour for baking. The big difference you'll find when using the Cup 4 Cup GF Flour compared to others is that it's so light. So many GF flour blends that are used for baking, even by some of the most popular gluten free bakeries, are just way too heavy to be used for a lighter baked good. The Cup 4 Cup GF flour is primarily a very light rice flour and you use as it is - literally substitute it cup for cup in any type of recipe. No other additions are required. As requested by friends, below is my mom's dough recipe. You'll have to work your own magic for the rest of the pizza. Gluten free or not gluten free, enjoy! This recipe will make 2 pizzas. Dissolve yeast in 1/4 c lukewarm water. Scald milk, add oil, sugar and salt to milk. When lukewarm add dissolved yeast and mix. Put part of flour in milk and mix really well. Then add the rest of the flour. Grease top of dough and cover. Let rise up to 1 1/2 hours. Roll dough out very thin. Transfer to greased cookie sheet. Notes: If you use GF flour, your dough will not rise very much. It also will not have the elasticity when you roll it out, so it may take some finesse on your part to learn how to manipulate it. In addition, they do sell a Cup 4 Cup Pizza Crust Mix. It think it's less expensive however, to buy a bag of the flour and make the dough recipe.